Would you purchase a Temperature sensitive concept tire? That has a white rubber sidewall strip that changes color when the temperature gets below 7°C or 44F? Apparently this is the point at which you should consider changing from all season tires or summer tires to winter tires. Some governments have even mandated this change to snow tires for safety reasons. 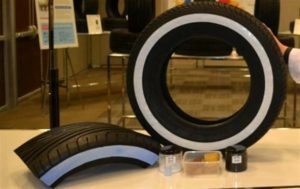 Canadian tire is partnering with the research and development organization ARTS to introduce a Temperature sensitive concept tire. It tells you when it is time to install your snow tires. If the temperature goes below a specific value the walls of your tires will turn white. This is to let you know it is time to install your winter snow tires on your car. Apparently when it gets but below 7°C it is time to replace your summer tires with winter tires. This is the best time to be prepared for the coming winter season. Many people wait until the first snow fall which usually means it is much colder than 7 degrees. The rubber in your tires is not providing the traction you need for these conditions. In addition you now can avoid the winter rush to have snow tires installed. As the temperature becomes lower, a tire with hard rubber provides less traction in snow conditions and cold wet conditions. Even though all season tires are designed for all seasons, a car driven with winter tires, which has softer rubber will provide much better traction in winter. This tire design is still in the concept stages with the research company and Canadian tire Corporation. Unfortunately, many people prefer not to have white walls on their tires and this may be the one marketing factor that will delay the introduction of this particular concept tire. Canadian Tire is trying to shift the time that consumers install winter tires on their cars. Most wait until the first snow fall. Then they rush into the tire shop to make an appointment to have their tires changed. There are usually long wait times, frustrated customers and employees who work long hours. In addition, it is already too cold for summer tires to be driven safely. Once it snows and the snow stays on the ground summer tires will not deliver the traction that is needed for winter driving conditions. If Canadian Tire is successful with this concept, they contribute to safer driving for consumers. Which means fewer accidents overall. They will also even out the workload somewhat. Consumers with tires that change color will get the jump on other consumers. They will not have to wait for hours until a mechanic can get to their car and change the tires for them. They can save time and money! Purchasing tires for your car has become much more complicated in the last few years. Not only do you need summer tires and snow tires, but there are all season tires and of course then there are speed ratings for the tires that you have, how much water they will dispel as you go down a flooded road and on and on. Then there are the various services that various car dealers and tire manufacturers provide to customers, when they purchased tires. What we found was that those companies that have a national or international presence often offer the best in tire services for their customers. 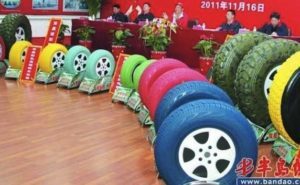 They tend to have greater volume, which means they can get better prices from the manufacturer for the tires that they sell which they pass along to in some degree to their customers. In addition they can offer services to their customers which are attractive for a number of reasons. We happen to like Costco as the premiere company to provide tires for the car that we drive. We will list their services to illustrate some of the reasons why they should be rated number one. Services such as free tire rotation, free balancing every 12,000 km’s is a significant benefit to us. In addition Costco has stores all across the US, Canada and Mexico. If you’re traveling by car you can drop into any Costco and have your tires rebalanced and rotated. They can also be repaired at no cost to you as long as you have your receipt with you. In addition our car also takes nitrogen in the tires which stabilizes the tires. It keeps them at a uniform pressure for much longer than tires filled with normal air. Not all garages have this capability. Although you can top up with air if needed, the preference is to use nitrogen to avoid changes in tire pressure due to change in temperature. Combining all of these services and the price and the ongoing maintenance provided by Costco for our tires on our car we are very satisfied with the company. We think that most customers would be interested in the services. Now that we’ve covered these services, we suggest consumers compare the services and the price provided by Costco. You can get the same at a better price go for it. Although you might pay a little bit more initially for your tires. Always consider the maintenance benefits and the cost of those benefits before making a decision. If you have to pay $20 per tire to re-balance the tires and then rotate them, any savings you gained can be quickly erased. It worked for us and we feel that we save a lot of money this way. By rotating the tires, you should get more mileage out of your tires than if you do not rotate them on a regular basis. Colored Tires – A New Fad? Are you tired of the same old black tires? We used to actually have white wall tires and they were very popular at one time until consumers decided they just were not cool anymore. I am not sure if you can even buy them any longer. consumers starting installing their tires with the white wall on the inside of the tire rim so that you could not tell that the tires actually had white walls. Times have changed and there is a new fad for tires. Well now you can buy tires that are colored to match your car or make a statement. Apparently they are really popular in Japan, however we have not seen here in North America yet. You can still purchase the standard black tires, but as you can see from the picture there are a variety of tiers in various colors now available. Yellow, pink, green and light blue tires are available to match your cars paint or just to make a statement. Imagine the looks you are going to get when people see you driving down the street with one of these babies. I am not sure that I am going to be one of them. I really cannot picture a set of tires on any car that I would drive. Imagine a hot rod with lots of power ready to hit the streets and impress the girls with yellow or green tires. Somehow that just does not seem to catch my imagination! Anyone driving a a nice car wants to have great wheels with alloy rims, the tires jet black and brand new. who would want to shell out the money to have colored tires on a muscle car for example? We also do not really see gram-pa or grandma picking up a sedan with colored tires. Sure it would be a conversation piece around the coffee shop or the golf course, but they have other things to spend their money on and it is not tires with colored sidewalls. Even the 30 somethings with a family are not going to spend money on this, they just have too much other things to put their money towards. So who is the target market for colored tires? Is there one? If you read this article we would really like to hear from you to get your thoughts and impressions on who might purchase these tires. We happen to think that people who are single, young and a have a bit if the artistic flare would be the potential buyers for this product. they just happened to like stuff that is different and attracts attention. They also have the money to spare and may be willing to shell out a few extra dollars for colored tires on their car. We are not sure if there is a large enough market for this product. There might be but it will take awhile to catch on! Now colored tires for golf carts would be all the rage and probably quite attractive. if everyone had different tires of various colors on their golf carts, the players would all get a good laugh and it would be something to talk about on the 19th hole. maybe it would be too distracting for everyone’s game to have a bright pink golf cart with matching pink tires roll up beside you just as you are about to hit your shot! let us know what you think about colored tires. We are in no way associated with anyone who is selling these tires, but thought it would be a neat addition to our blog for our readers. 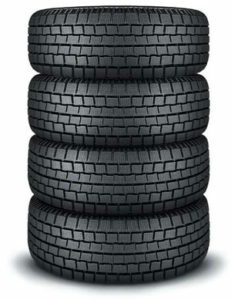 For more posts about buying tires and specialty tires, click here. Winter Tires 101 – What you should know! Many people do not worry about having winter tires on their car, preferring to go with all season tires instead. The fact of the matter is that winter tires will provide a better grip in snow and ice conditions and provide a safer ride for you and your passengers. All season tires are made of a harder rubber that is great for dry conditions but lose elasticity in colder weather. They have to adapt to all kinds of conditions and a wide range of temperatures from hot weather to really cold weather conditions and as a result you are not going to get optimum performance at the wide temperature extremes. Most consumers would be better off to own both a set of winter tires and also a set of summer tires. Winter tires on the other hand are made from softer rubber compounds that stay flexible even in the extreme cold conditions of the northern US and Canada. They are also designed to deal with snow covered roads and icy conditions and are more optimal for temperatures below freezing. Snow tires have been optimized in another way as well. They have deeper tread patterns than regular summer tires and also all season tires. They are designed to get a better grip on the road in heavy snow and they also provide better grip to prevent skidding. these same tires combined with anti lock braking systems provide better braking as well. Many people believe that two winter tires are all that is required. 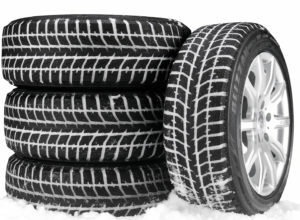 The experts agree that 4 winter tires are much more desirable for traction as well as braking. They provide more stability in snowy conditions. If you only place winter tires on the front of a front wheel drive car, you will get better traction in the snow, however when it comes to braking the rear tires with less traction will cause you to spin out of control. Four winter tires will provide optimum control for traction purposes as well as braking in ice and snow conditions. The same applies to rear wheel drive cars, but differently. If you place snow tires on the rear wheels of a rear wheel drive car, again you will have good traction, however when breaking or trying to steer you do not have the same level of traction with the front wheel tires, unless they are winter tires. You can easily lose control and not be able to steer out of it. Tires that are designated as all Season tires have a label M+S on the side of the tire indicating that they are ok for light snow conditions. These narrow treads are not sufficient for harsh road conditions that many people deal with in heavy snow areas. They are useful and save money for consumers who do not experience a lot of snow. However some jurisdictions are going so far to enshrine in law that snow tires or winter tires must be on the car from Nov 1st until Mar 31st of every year. Mountainous areas also require snow tires and some even require chains to be added to the wheels. Winter tires have a symbol of a mountain and a snow flake on the sidewall. The treads are wider and deeper than all season tires. they are also designed to disperse snow and ice more effectively. they perform as much as 130% to 150% better in severe snow conditions. Also handling is much better as well for steering and braking situations. If you have driven in snow conditions with and with out winter tires, then you already know and appreciate the difference. If not and think you can get away with all season tires, try it once or twice in heavy snow to see the difference in handling and control. Try a friends car who has snow tires vs. your own to really appreciate the difference. Comments are welcome especially from drivers who know the difference and have a story to tell about the difference winter snow tires can make. Ignoring the tires on your car at any time of the year is one of the fastest ways to prevent your car from getting good gas mileage. 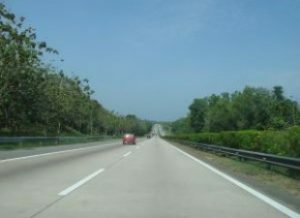 It can also causing unsafe conditions for handling your car at high speeds on the highway. With the price of gas sky rocketing, now is a good time to check your tires. We cover a few tires and summer driving tips. Checking your tires to ensure you are traveling on correctly inflated tires is one of the easiest ways to save money on gas. Making sure they are properly balanced and your front end is aligned is another. Statistics are provided by the Energy Information Administration and the Environmental Protection Agency. They suggest that it is possible to save between $100.00 to $200.00 per year by avoiding under inflated tires. Of course your individual savings is based upon how many miles you drive and how under inflated your tires are. Your car will also be more stable on the road and you can avoid accidents more easily if your tires perform well. There is at least one tire under inflated by more than twenty percent (20%) on approximately twenty-three per cent (23%) of cars based on information from the Canadian Office of Energy Efficiency. That means that almost 1 in 4 cars has at least one under inflated tire. Besides lowering your fuel consumption, under inflated wheels can also lead to steering and braking problems. That makes under inflated tires a possible danger. Using a tire gauge is the only sure way to know if your tires are under inflated but a telltale sign of under inflated tires are loud squealing when coming to a stop or turning a corner even at slow speeds. Driving a car with just one tire under inflated by (8 psi) or 20% can lower the car’s fuel efficiency by 4%. In addition under inflation may reduce the life of the tire by more than 9000 miles. Tires are permeable. That means that air can and does pass through the tire walls. A tire could lose up to 2 pounds of pressure per month. This is more important in summer as more air permeates through the tire in hot weather as the pores in the tire material get larger in the heat. To repeat that was just stated heat can accelerate air loss in tires. When a tire is under inflated, the sides of a tire flex and bend more than normal. This builds up heat in the tire. With that additional heat an under inflated tire will to lose air at faster and faster rate. There is more bad new concerning under inflated tires and gas consumption. Under inflation also causes the tire to increase rolling resistance. That means the motor has to work harder to move the car and that also increases fuel consumption. Also the extra flexing and bending can weaken the tire walls which could lead to sudden tire failure. You should make it a habit to measure the air pressure in your tires at least once every month. When you measure your tire pressure the tires need to be cold. A tire on a car is considered “Cold” if the car has not been driven more than 1 mile or the car has been sitting still for at least three hours. It is a great idea to keep a pressure gauge in your car. Check the air pressure of the tires often. If you can keep your tires at the correct inflation levels you should realize a savings of between $100.00 and $200.00 per year in fuel. Although proper tire pressure will save you gas and money, it could also prevent tire damage that could lead to accidents. Not only will you be contributing to your fuel economy you will be maintaining the safety of your vehicle. SUV’s wheels and tires are one the most essential parts of your vehicle. SUVs, such as the Land Rover Range Rover, are 4WD, and can go through any terrain that the planet could offer. In fact drivers with 4WD and a SUV combination have been known to take their vehicles into some of the worst conditions possible. When they are driving in off road situations, the tires and wheels of your SUV help you to reach your destination because they are the major equipment that drives your vehicle through all kinds of conditions. However, the functions of the wheels and tires do not just end there. 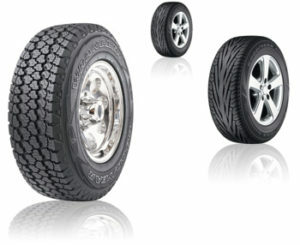 Your SUV tires also emphasize the overall appearance of your vehicle. Some people will customize the rims and tires to make a statement. Consumers spend thousands of dollars on tires and rims to really enhance their vehicles every year. Purchasing the proper wheels for your SUV can actually improve your SUV’s performance just by effective cleaning. Like any other car parts like Land Rover Range Rover parts, SUV wheels can eventually be corrosive and tires can wear out as well with hard driving in less than perfect conditions. Always check the condition of your SUV tires even if you only drive it on the road. Check the tire pressure and the amount of tread that is left on the tires to avoid blowouts and losing control at high speeds. This is going to be a common theme throughout this web site. Vendors sell tires that are brand new, however some have been stored for a long time before they are eventually sold. Check the age of the tires before they are installed, before you purchase them to make sure they are not older than 6 years. Recently there was an article about several stores selling new tires that had been sitting on the shelf for more than 7 years. Rubber tends to become brittle as it ages and can blow up at high speeds. Getting your SUV perfectly cleaned on a local car wash is a great idea. However, the only drawback of it is the cost that you would be spending in a car wash. Why go to a car wash if you could clean your wheels by yourself, right? Whenever you use your SUV for a long travel or even on a short trip, dust particles attack the surface of your wheels. Other unwanted dirt on your wheels and tires include road tar, mud, and brake dust. Acid rain and winter salt are effective irritants as well as long exposure to hot sun can make your wheels brittle. Cleaning your wheels and tires is actually the first step in car washing. You should first select the best tire cleaner for your wheels and tires. There are a lot of cleaning agents out in the market today but you should choose the safest and most effective cleaning agent for your wheels and tires. Some cleaning agent contains a high level of acidity and can easily damage your wheels. Acid-free cleaners are effective cleaning agents that are commonly used by car wash shops. The most common cleaner is the household detergent because you can find it anywhere in your kitchen, or toilette, of course. Not only that, detergent is also effective and is the safest cleaner because it does not contain any harmful ingredients that can affect your car. Wheels and tires of SUVs are much larger and broader than other vehicles so the cleaning process most likely will take longer compared to sedans. Now let us start with the cleaning process. First, you should check your tires for road dirt and mud. If you found one, then scrape it with any hard object you can find in your place, but be careful not to scratch your tires so hard. Dilute your chosen cleaner in a bucket of water and then start brushing your tires. The grooves of your tires are the most susceptible to mud and road tars. Brush it effectively. After cleaning your tires, proceed to the wheels. Rinse the brush that you had used in your tires and start brushing your wheels in up and down motion. Pretty easy, right? You should actually clean your wheels and tires once a month for maintenance.